If you are looking to provide your services, solution or equipment to the trucking fleet operators across the world, Blue Mail Media brings the best asset for you – Trucking Fleet Operators Email List. This list is a repository of contact records of truck fleet owners and truck fleet operators in various organizations in the US, UK, APAC, and other regions of the world. Get this list customized as per the needs of your marketing campaigns and win your significant prospects like never before! To target your business prospects right, you don’t just need a reliable marketing data. You need a database that is reliable as well as customized as per the different goals and challenges of your multi-channel marketing campaigns. 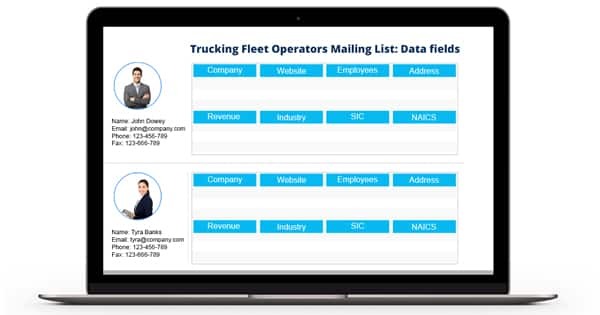 Blue Mail Gives you the privilege of getting your Trucking Fleet Operators Email Database customized according to the selects –trucking fleet companies, operators, truck fleets by size, truck fleets by cargo, C-level executives, industry professionals, and more. Bring better conversions and achieve higher ROI with a customized database!